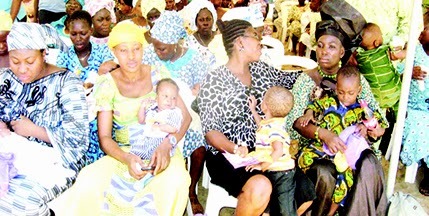 Thirteen years after Nigeria launched the prevention of mother-to-child HIV transmission (PMTCT) the country has only attained 23.9 per cent coverage in Antiretroviral (ARV) treatment or prophylaxis among HIV positive pregnant women, while 40.64 per cent of them have been counselled, tested and received their results. This is even as experts have warned that unless the country leverage on current international focus on her and the readiness to assist her in scaling up PMTCT services it may not meet its target of eliminating Mother-to-child transmission (MTCT) by 2015. They noted that the persisting high burden of HIV infected pregnant women and MTCT in the country is an indication of the need to urgently scale-up the PMTCT program and make the services accessible to all women especially those in the rural areas. In 2009, the country developed a five-year national scale up plan towards elimination of MTCT of HIV which span from 2010 to 2015. It adopted a combination of World Health Organisation (WHO) 2010 Guidelines Option A and Option B regimens for prophylaxis. Adult HIV prevalence (ages between 15 and 49) in country, estimated at 3.6 per cent in 2009, appears to have stabilized over the past five years. HIV prevalence among pregnant women, 3.6 per cent, is comparable to the general adult population. Maternal mortality was still very high in Nigeria (630/100,000 live births) in 2010 and it is estimated that 230,000 pregnant women and 360,000 children were living with HIV in 2010. PMTCT programme coverage was very limited as only 4.7 per cent of ANC facilities in Nigeria offer the services. Although HIV testing among pregnant women increased from one per cent in 2005 to 14 per cent in 2010, it was also considered very low. Worse still, only 18 per cent of pregnant women living with HIV (PWLHIV) received more effective ARVs for PMTCT 2011. Also, only 11 per cent of children born to PWLHIV received ARVS for PMTCT, and only four per cent of infants born to PWLHIV were tested for HIV within two months of birth in 2010. Furthermore, only 40,465 (23.9 per cent) assessed ARV for prophylaxis, while the target was 169,484 in 2012. In addition, only 1,679, 988 (40.64 per cent) were counselled and tested and received their results, while the target was 4,133,752 the same year. Perhaps more worrisome is the latest report by the United Nations which showed that Nigeria has the highest number of children contracting the Human Immunodeficiency Virus, HIV, in the world. The report says nearly 60,000 Nigerian children were infected with the virus in 2012, a figure higher than that of any other country in the world, and is a source of worry for experts with one describing it as “alarming.” The report titled “2013 Progress Report On The Global Plan: Towards the elimination of new HIV infections among children by 2015 and keeping their mothers alive” is the most recent on the global plan which seeks an elimination of new HIV infections among children by 2015, as well as keep their mothers alive. The programme was launched in July 2011 at the UN General Assembly High-Level Meeting on AIDS (acquired immune deficiency syndrome). Experts have therefore cautioned that the failure of the nation to attain 50 per cent target in the PMTCT global plan makes it share 32 per cent global burden in PMTCT and may tarnish the much celebrated success in the reduction HIV infection from 4.6 per cent in 2008 to 4.1 per cent. Recent reports confirmed that nation recorded PMTCT of HIV of less than 25 percent between 2011 and 2012. There are fears that this trend may also scuttle efforts to reduce HIV incidence among 15 to 49-year-old women by 2015 by at least 50 per cent unless urgent steps is taken to scale down the rising incidence of paediatric HIV infection through PMTCT. Corroborating earlier views were university dons, in their article titled: Agboghoroma CO, Sagay SA, Ikechebelu JI. Nigerian prevention of mother to child transmission of human immunodeficiency virus program: The journey so far. J HIV Hum Reprod 2013;1:1-7, • As gap in mother-to-child HIV transmission widens the academics decried the PMTCT situation in the country. In addition, Dr. Rajiv Shah, the Administrator of United States Agency for International Development (USAID), recently announced that United States government spent a total $16 million prevention of mother to child transmission of HIV last year. Estimates from the joint United Nations AIDS programme (UNAIDS) have also showed that not less than 3.14 million Nigerians were found living with HIV as at the end of 2011. This corresponds to 4.1 per cent of over 150 million being the estimated total population of people in Nigeria according to the most recent National Demographic Health Survey (NDHS of 2008)- carried out in the country. The NDHS was based on population estimates obtained by the Nigerian Population Commission (NPC) during the 2007 nationwide census. Daily Newswatch also learnt that 281,180 new infections also occurred during the period in focus, of which 154,920 were children. According to the 2011 UNAIDS statistics, globally, Nigeria alone accounts for 21 per cent of new infections in children.Further statistics made available by the United Nations Children Fund (UNICEF) showed that in Nigeria, 10 per cent of all HIV infections are as a result of mother-to-child transmission. Also, records from the Federal Ministry of Health show that in 2011, only 15. 89 per cent of HIV-positive pregnant women received ARVS to reduce the risk of mother to child transmission, just as only 2.3 per cent of infants born to HIV-infected women (HIV-exposed infants) received ARV prophylaxis to reduce the risk of early mother-to-child- transmission in Nigeria. About six million babies are born in Nigeria yearly. At the end of 2011, 229,480 pregnant women were found to be HIV positive, just as an estimated 57,000 infants are exposed to the virus yearly. PMTCT is an intervention that aims at reducing to less than two percent the risk of Mother to Child Transmission of HIV through the use of anti-retroviral (ARVs) as either prophylaxis or therapy given to women in pregnancy, labour and during breastfeeding. In situations where a mother is not receiving ARVs during the breastfeeding period, the breastfed infant is placed on ARV prophylaxis until one week after cessation of all breastfeeding. Where breastfeeding is not possible, the use of commercial infant formula is usually advised as alternative. He continued; “17.6 per cent of the HIV-infected pregnant women in 2011, received antiretroviral insisting; “there is major challenge in the area of PMTCT coverage which is 16 per cent only.” Also, a United Nations Development Programme (UNDP) report, recently confirmed that the nation reported prevention of mother-to-child transmission (PMTCT) of HIV of less than 25 percent, thus joining six other sub-Saharan Africa countries — Angola, Chad, Congo, Eritrea, Ethiopia and South Sudan — which also recorded a not-impressive performance between 2011 and 2012. The UNDP tweeted a Joint United Nations Programme on HIV/AIDS’ (UNAIDS) Regional Fact Sheet for 2012, observed a decline in new HIV infections and AIDS-related deaths across the region. The UNDP report stated that in the area of preventing new infections among children between 2009 and 2011, the report noted that the number of children newly infected with HIV in sub- Saharan Africa fell by 24 percent. In Nigeria, the national PMTCT program commenced in 2002 with supports from the World Health Organisation (WHO) and UNICEF. There are currently about 1, 320 PMTCT service points across the country. Meanwhile, the coverage for the people in need of PMTCT still remains low. Out of 210,000 HIV positive women, only 22 per cent are covered by ARV/ART for PMTCT. This is considered low compared to the corresponding MTCT rate of 32 per cent as at last year. Globally, HIV is a leading cause of death in women of reproductive age and since nearly all HIV infections in children are acquired from their mothers, the global epidemiology of HIV in children reflects that of HIV in women. Over 90 per cent of infections in children are acquired through MTCT. With over 60 per cent of adults living with HIV being women, the number of infected children has been growing. This, experts say occur during pregnancy, labour and delivery or during breast-feeding. In the absence of interventions, the risk of such transmission is worse- 45 per cent. A member on the National Task Team on PMTCT, Emmanuel Enabulele, in a report said that MTCT is fast becoming a burden in Nigeria compared to the rest of the world due to higher prevalence of HIV in women of reproductive age, high total fertility rate, characteristically prolonged breastfeeding culture, stigmatization by healthcare givers, and poor access to PMTCT interventions as a result of the Federal Government not living up to its promises among others. The federal government had, in 2010, committed to reducing by at least 50 percent HIV incidents among women aged between 15 and 49 be reduced by 2015 as well as ensure that at least 90 per cent of all pregnant women have access to quality HIV counselling and testing by 2015. It has also conceived that by 2015 at least 90 per cent of all HIV positive pregnant women and breastfeeding infant-mother pairs will receive ARV prophylaxis, at least 90 per cent of all HIV exposed infants have access to early infant diagnosis services and at least 90 per cent of pregnant women requiring ART for their own health receive life-long ART. This is based on the Joint United Nation AIDS Programme (UNAIDS) target of achieving zero mother-to-child HIV infection by December 2015. This might be some huge steps towards bridging the PMTCT gap if the nation lives up to its commitment. To fix the missing links, experts have said there is need for Nigeria to increase funding for PMTCT by government at all levels, strengthen health systems capacity building, improve co-ordination and integrate Maternal, Newborn and Child Health (MNCH) programmes. Also, Osahon Enabulele, the President of the Nigerian Medical Association, NMA, said there is a huge gap in the prevention of mother to child transmission of HIV, PMTCT, and added that more strategic policies in the area of PMTCT need to be implemented. Enabulele, observed that access to antiretroviral drugs and awareness about the virus has helped reduce the prevalence of HIV in Nigeria, but the country is still off-track in combating mother to child transmission (MTCT) of HIV. Experts are optimistic that if the nation lives up to her commitment to the UNAIDS target of achieving zero mother-to-child HIV infection by December 2015, nearly all cases of MTCT of HIV infections can be prevented by PMTCT programmes that provide highly effective ART and ARV prophylaxis interventions.